At Bonanza, we empower entrepreneurs to create their dream businesses, minus the busywork. Building your online store takes vision, dedication, and time -- so you need to know you’re building on a solid foundation. That’s why we work tirelessly to create the best tools available to drive sales and help you build a vibrant, stable ecommerce shop. In this 10 minute article, we’ll get into detail about how Bonanza brings you more traffic, and how we help you convert that traffic into sales -- and more importantly -- repeat customers. 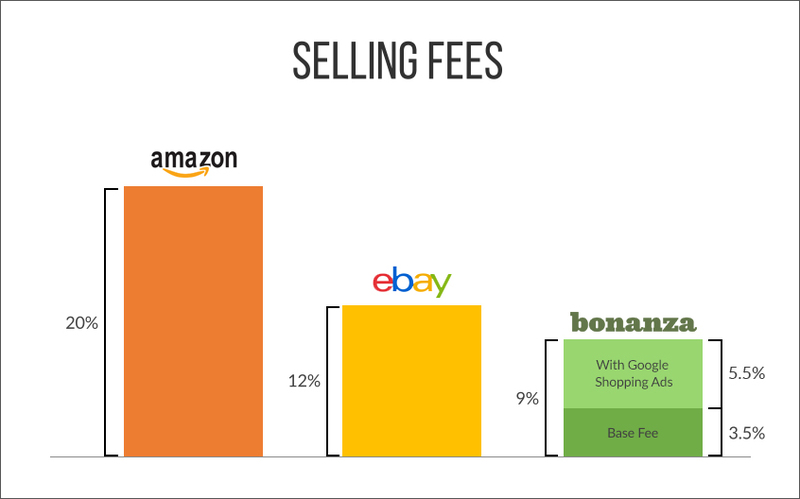 Most popular marketplaces charge 10-20% in selling fees - and that's not including the cost of listing an item, which doesn't exist on Bonanza. Our fees start at 3.5% with the option to join our Advertising Program and select from a variety of commission rates. You can pick a rate of 9%, 13%, 19%, or 30% -- higher rates mean more buyer visits from Google Shopping and other sources (you’ll read more about this below). Bonanza pays these advertising costs upfront, so you only pay when you make a sale. Additionally, you'll never pay more than the maximum commission rate you've opted into. Regardless of whether you participate in advertising, sales that you drive to Bonanza through your direct referral link are free (zero fees). Blog visitors, social media followers, email subscribers, or other audiences you control will cost you nothing to transact with on Bonanza (provided you use the referral link). In addition to revenue, each sale brings you one more buyer relationship that Bonanza will help you to cultivate. Our inaugural advertising partner, in 2008, was Google Shopping (“Froogle” at the time). We were the first marketplace to invest heavily in Google Shopping, and we’ve maintained our leadership in the space by giving our sellers the opportunity to tune their Google Shopping traffic up or down, incurring no fees until your items sell. Behind the scenes, Google charges Bonanza on a per-click basis for the traffic your products receive. We use a predictive bidding engine to absorb all upfront costs while we build your store’s credibility within Google. It’s then up to you whether to optimize for volume or profit of sales. For example, if your item costs $100 and you are paying 13% commission, we could afford to bid $0.65 per click if one out of every 20 visitors purchased an item upon visiting your store (a 5% conversion rate). If you moved to commission to 19%, we could afford to bid $0.95, assuming the conversion rate stayed the same. 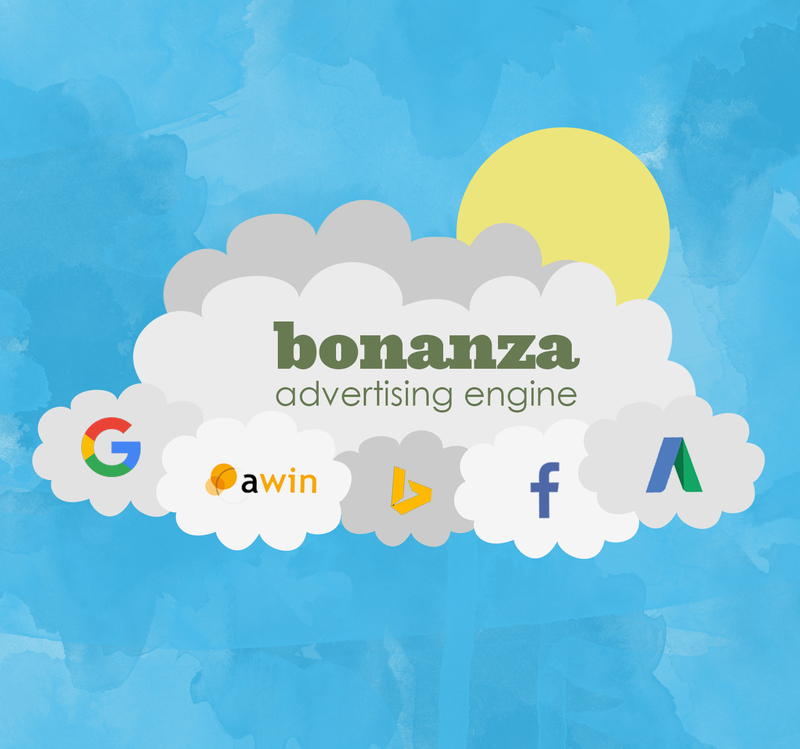 Beyond Google Shopping, we automatically connect you with third-party publishers through our proprietary Affiliate program. 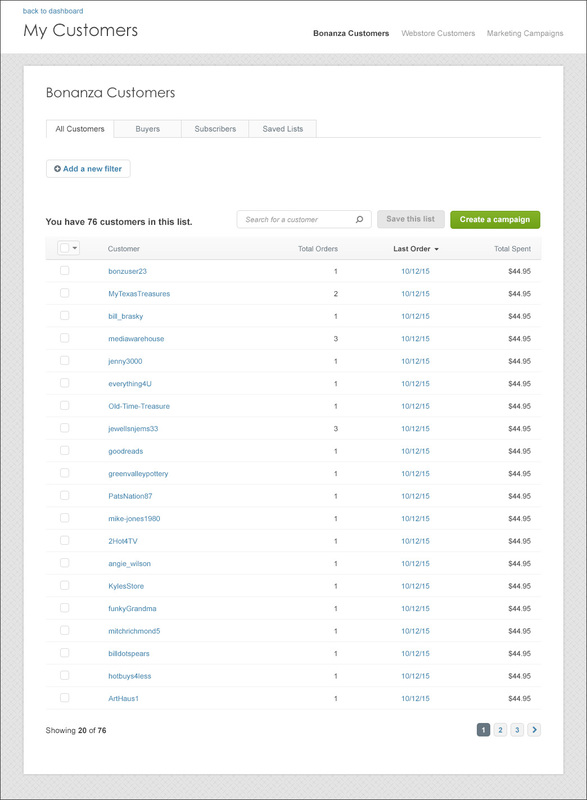 When our affiliate partners (blogs, review sites, etc.) send a shopper who buys from your store, that partner receives a commission from us, using the advertising rate you opted into. We also allow you to connect your merchandise to buyers on Bing Shopping and Facebook. These ad campaigns are paid for by Bonanza, and typically cost us more than we earn on the resulting sales. We consider these channels a loss-leader to earn your loyalty. Most marketplaces focus exclusively on promoting their brand to buyers. Amazon buyers rarely know which seller their product came from. If the seller is especially successful, Amazon has a habit of building the sellers’ product themselves to undercut the merchant. We don’t think this practice is fair for hard-working sellers. Bonanza works to strike a balance that allows sellers to make sales and build a brand. We consider investment in advertising channels a vital bridge from your store to millions of potential repeat buyers. The secret to success on Bonanza lies in what you do once you start building your customer base. Other companies closely guard your customer data, but we believe that you should be able to establish a relationship with your past customers. Larger marketplaces like Amazon or eBay don’t provide sellers with buyer information, so there is no opportunity for sellers to develop rapport with their customers. Without this personal connection, customers typically buy based on price, and price alone. Your success on these marketplaces is thus contingent on offering the best price. Once a competitor can get your product at the same or better price, your financial lifeline becomes obsolete. Bonanza’s business relies on making successful sellers, so we have built our entire site around showcasing individual sellers. Information about your booth is featured on each item listing, and shoppers are encouraged to browse your other items. Shoppers can also send you a direct message from any item listing page. Communication and visibility allow you to build a personal connection with your buyers and turn them into repeat customers. Success on Bonanza is a more stable sort than “success” on Amazon or other competitors. Bonanza drives traffic to your booth, which turns into buyers, which helps build a sustainable business. If you’ve got great merchandise, you can leverage our customer-obsessive feature set to rapidly grow a store that’s scaled to your aspirations. Customer Marketing Tool. This tool was created to give sellers the opportunity to turn one-time buyers into repeat shoppers. With this tool, you’ll be able to view data about your past customers and then sort, filter, and save groups of customers based on these details. You can use these lists to craft customized marketing campaigns. Learn more about how this tool works and how to use it to your advantage here. Seller Stats Dashboard. Bonanza is dedicated to providing actionable data that sellers can use to improve their online business. Our stats dashboard displays information about item views and revenue in one convenient place. A single glance will allow you to easily spot item trends and growth patterns to help you control inventory, change prices, and more. 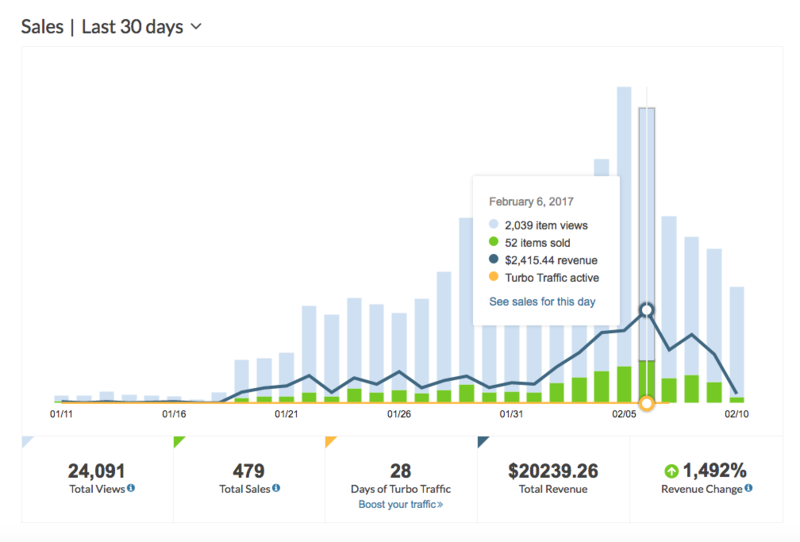 The graph will also show when you had Turbo Traffic active, helping you quickly visualize its traffic-boosting benefits. Webstores. We are constantly improving our Webstores platform, which allows you to create your own branded online presence while managing your inventory through Bonanza. With Webstores, you can introduce buyers from your booth to your Webstore inventory, where you pay zero fees on all sales made. The magic of Bonanza is that there are countless paths to success -- there is no single formula to follow. You have the freedom to build your business the way you want. This power derives from your access to the best tools for understanding buyers, optimizing your listings, and converting one-time buyers into repeat customers. Our mission is to empower entrepreneurs to build a strong, lasting brand. Bonanza stands apart from its competitors because we give sellers the opportunity to customize their business in a way that works best for them. It doesn’t matter what you’re selling - Bonanza is well-suited for sellers of all sizes and inventory types. Whether you have a few items taking up space in your garage, a smattering of carefully handmade items, or a vast collection of anything and everything to sell, Bonanza is a place that you can be successful. All of our tools are designed to attract buyers that will establish your brand without demanding too much of your time. It’s not a coincidence that the tools we offer can be customized to fit our sellers’ needs. Experience has proven to us that listening to our sellers feedback is the best opportunity we have to consistently improve our product. That’s why we’ve streamlined communication in a multitude of ways. We have a dedicated feedback site, conduct regular surveys, and take other no-nonsense measures to ensure we spend time building the features you need without wasting time on the features you don’t. Bonanza’s commitment to entrepreneurs is what keeps us laser-focused on the needs of our sellers. Strategically investing in Bonanza will pay off, and success is possible in countless ways when you take advantage of the tools we’ve designed with you in mind. We cater to ambitious sellers by helping them build a roster of loyal, repeat customers. We’ve been helping build successful businesses since 2008; we’d be honored by the opportunity to help you build yours.